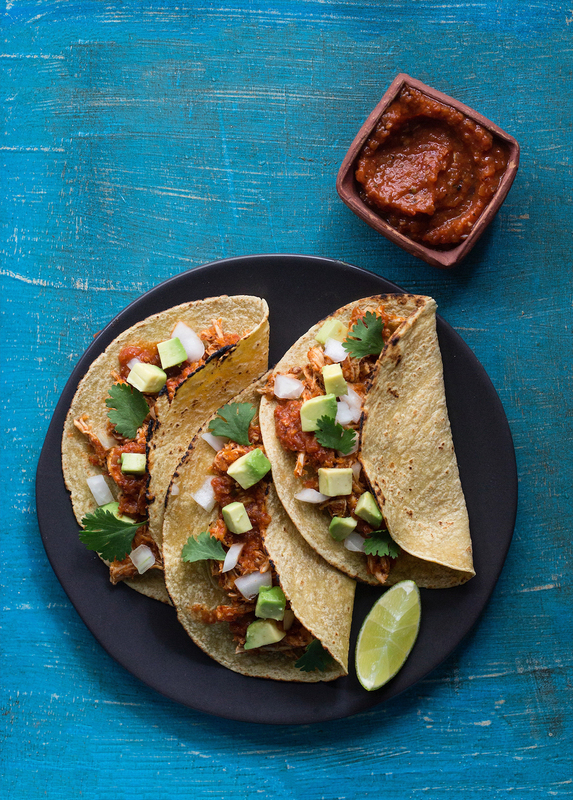 My Chicken Tinga Tacos recipe is going to be your new favorite busy-weeknight meal! The shredded chicken filling is cooked in the most delicious tomato sauce on the planet, all stuffed in a taco. This smoky, spicy, and earthy tinga sauce takes less work to make than the flavor would lead you to believe. The chipotles in adobo add most of the depth, while the spices, canned fire-roasted tomatoes, and onion add more layers of flavor to the sauce. The spicy, smoky chipotle chile sauce called tinga transforms plain chicken into something downright addictive. When it’s folded up in a taco and topped with some avocado to balance out the heat of the sauce, it’s absolute perfection. Heat each of the tortillas on the stove top, flipping constantly with a pair of tongs, until lightly toasted. Place a large spoonful of the chicken in the middle of each of the tortillas and top it with the chopped onion, avocado, and cilantro. Serve with some lime wedges.